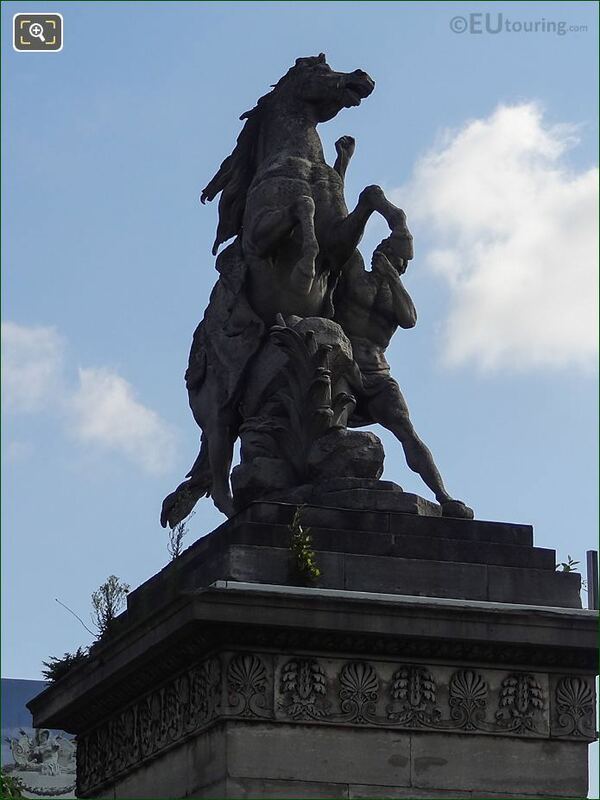 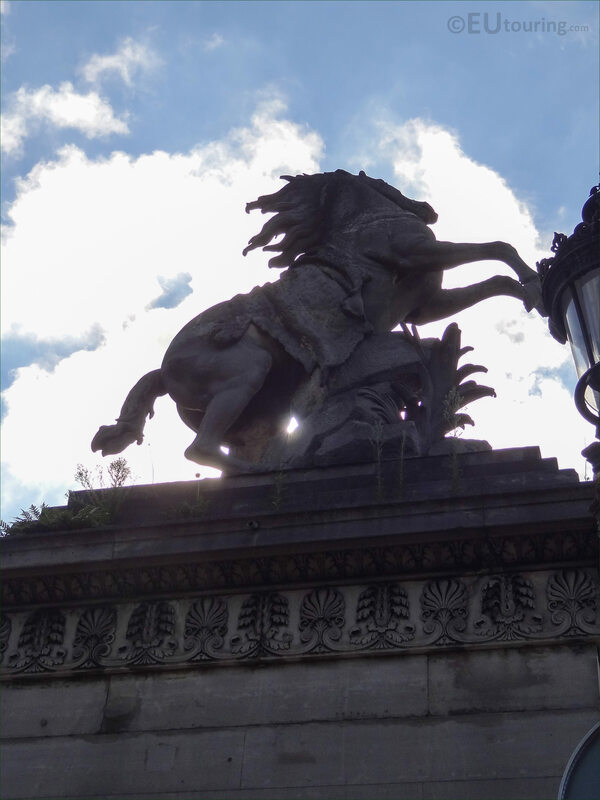 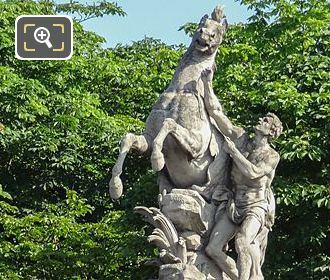 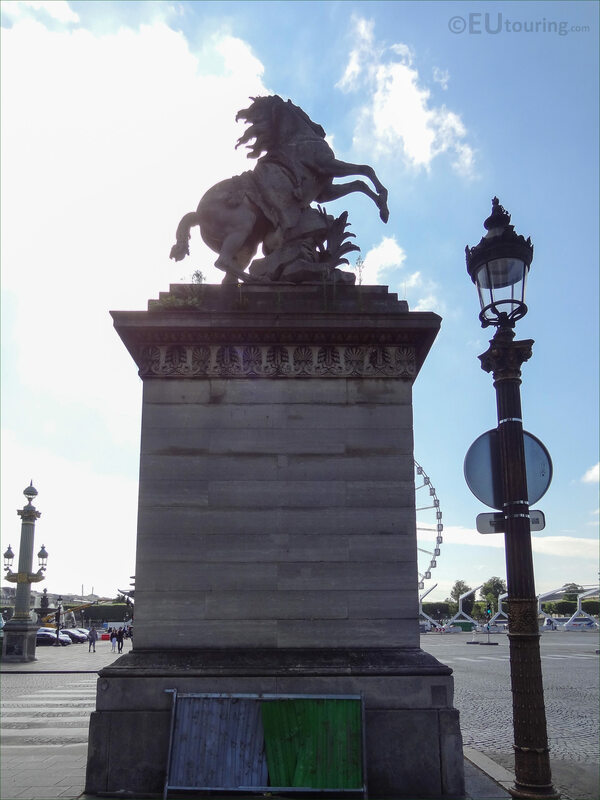 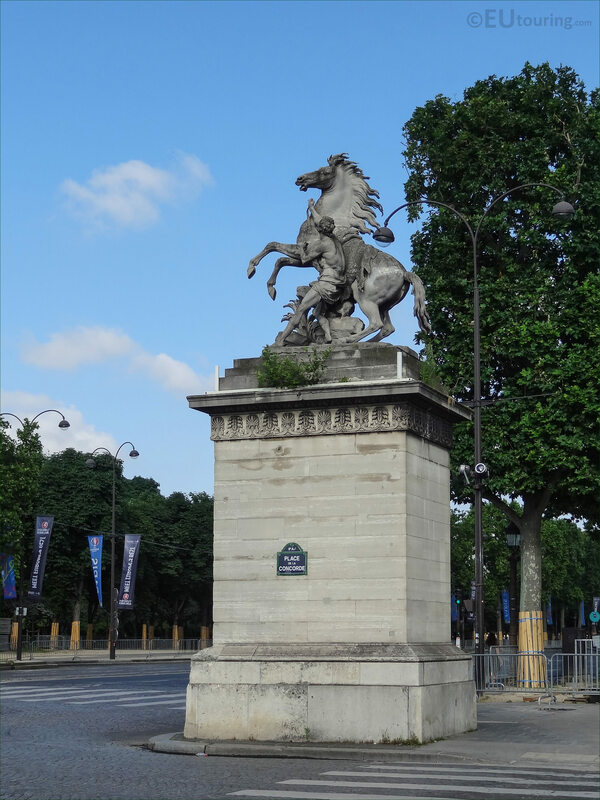 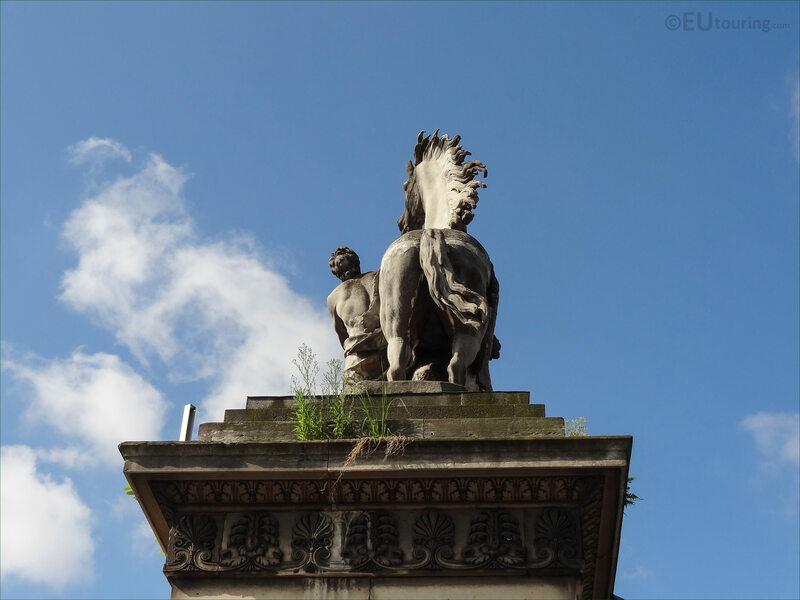 While we were in the 8th Arrondissement of Paris between the Avenue des Champs Elysees and the Place de la Concorde, we took these high definition photos showing a statue called Cheval Retenu par un Palefrenier, also known as one of the Horses of Marly, which was sculpted by Guillaume Coustou. 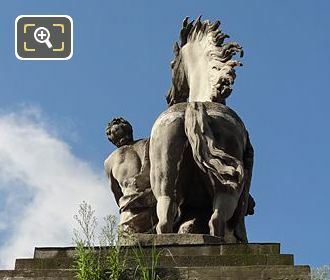 This first HD photo shows one of two statues that are known as the Chevaux de Marly, or Horses of Marly, yet the full official name for each one of these is Cheval Retenu par un Palefrenier, which in English translates to Horse Restrained by a Groom or a Horse Held by a Groom. 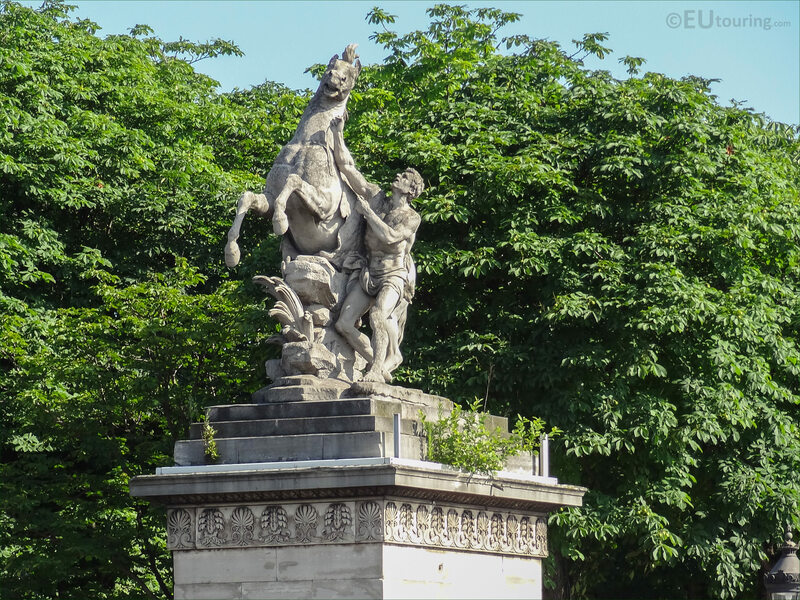 There was once a royal hunting lodge that became known as the Chateau de Marly, and during the reign of King Louis XIV statuary was added to the park including two equestrian statues by Anotine Coysevox, yet these were moved to the entrance of the Jardin des Tuileries, but King Louis XV wanted these replaced to adorn the area by the water trough at the park, and this close up photo shows one of these. 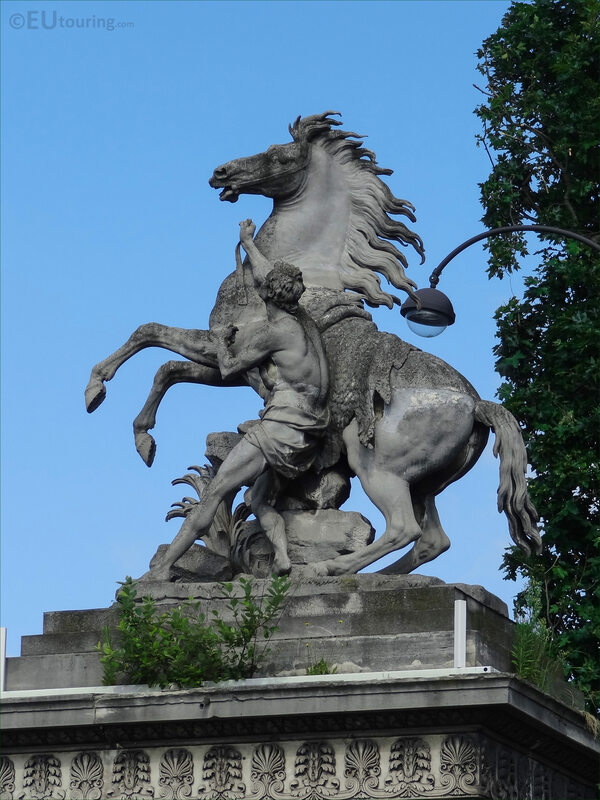 The Marly Horses, or Chevaux de Marly, were commissioned by King Louis XV to the French sculptor Guillaume Coustou, who was born in 1677 in Lyon and the nephew of Antoine Coysevox, known as Guillaume Coustou the Elder, he won the Colbert Prize, which later became known as the Prix de Rome, and upon his return to Paris worked with his uncle as well as his brother for both King Louix XIV and then King Lous XV. Rather than equestrian statues on a mythological theme, often including Pegasus the winged horse, Guillaume Coustou decided to opt for a more logical and authentic approach to producing the two statues called Cheval Retenu par un Palefrenier for the Abreuvoir, or watering trough, located at the entrance to the Chateau de Marly and the models of these were chosen by King Louis XV in 1743. 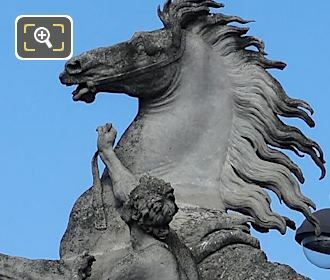 The original equestrian statues of the Horses of Marly, or, as each one is officially called, Horse Held by a Groom, were produced in Carrara marble, named after a specific type of marble from an area of Italy, and measuring a height of 3.4 metres and a length of over 2.8 metres, these two statue groups were finished by 1745 and put into place within the Marly park of the royal residence in that same year. 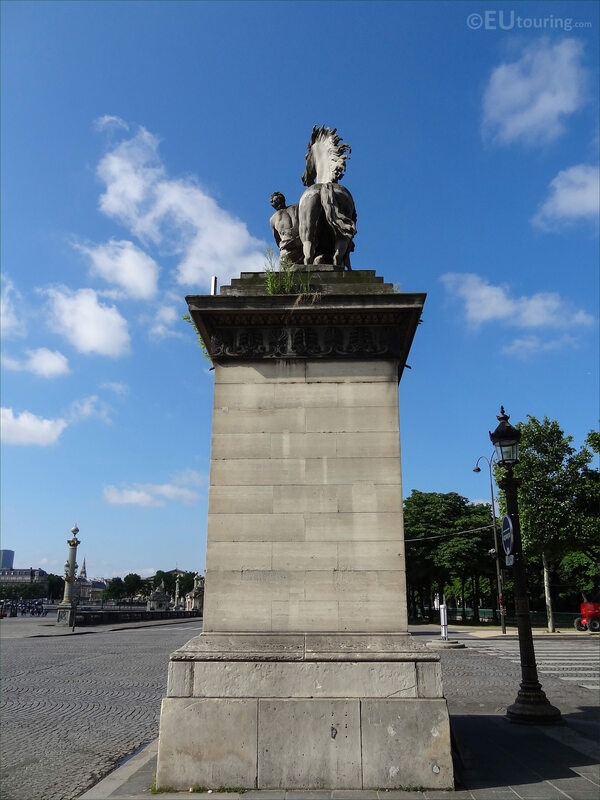 However, the Chateau de Marly is no longer in existence and many of its statues were actually moved to other locations, which included the statue you can see in this photograph of a Cheval Retenu par un Palefrenier, that was moved to Paris and placed on the top of a very tall pedestal in 1794. 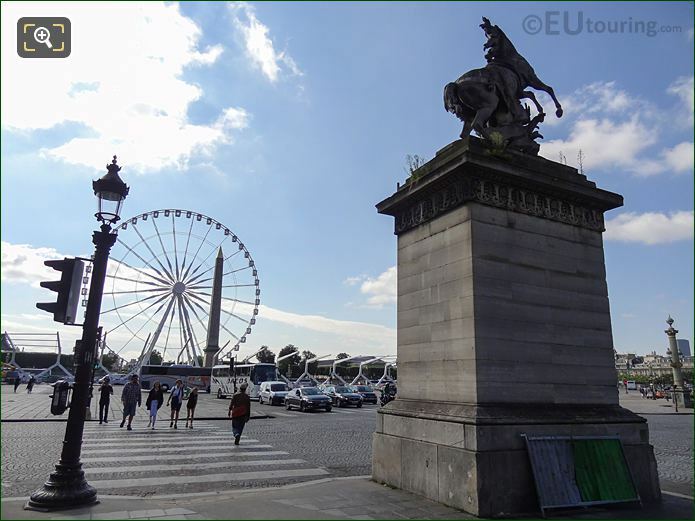 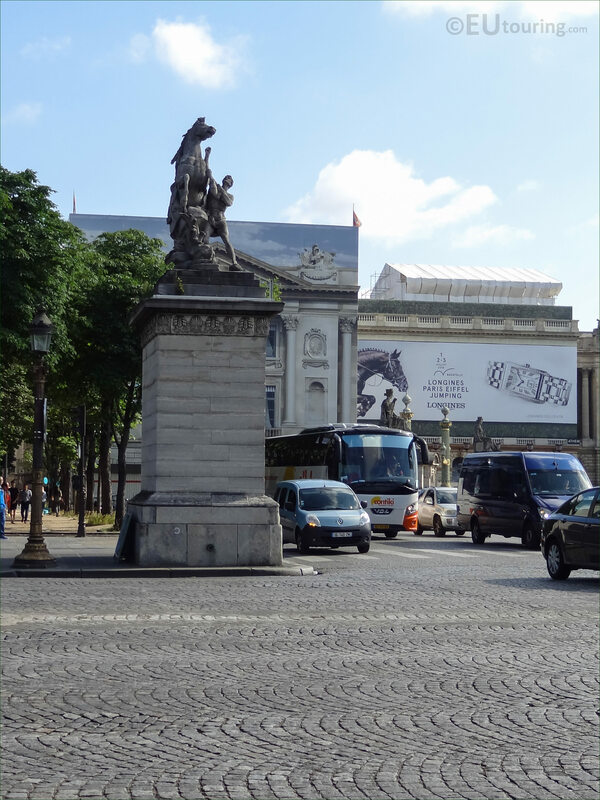 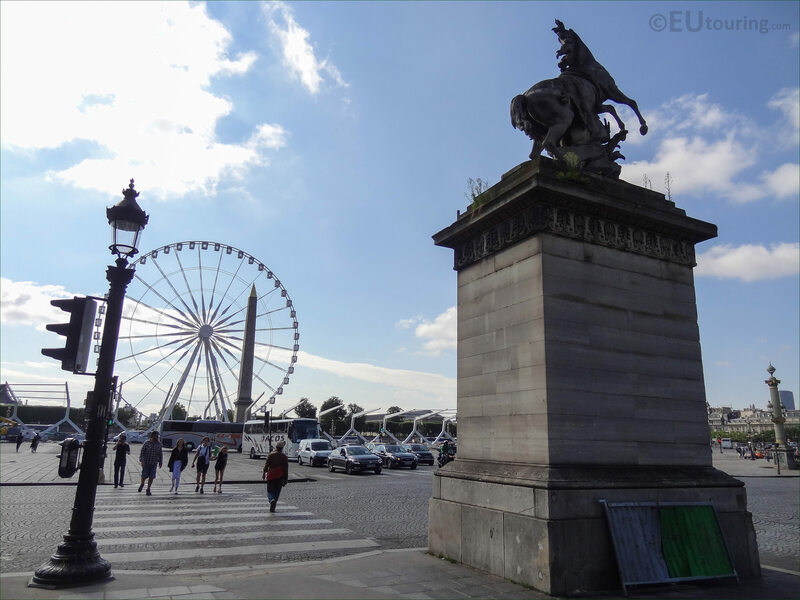 And we took this image while at the start of the Avenue des Champs Elysees looking past the south side Chevaux de Marly statue towards the Place de la Concorde where the big wheel had been set up and stands were being erected in readiness of the formal parades and the celebrations for Bastille Day on 14th July. Although the Horses of Marly had already been restored once in the 1800s, by the start of the 1980s there were becoming increasingly more fragile due to the weight of traffic travelling around this important part of Paris, not forgetting the armoured vehicles and parades that would pass by these marble statues for major celebrations, so it was decided that the two statue groups would be removed. Therefore, the original marble statues by Guillaume Coustou, both depicting a horse and groom, were moved into the Musee du Louvre where they can be found within the Richelieu wing in a dedicated area called the Cour Marly, which is where you will also find other statues that originated from the Chateau de Marly, and these were again restored between 2004 and 2005 through the patronage of Pari Mutual Urbain. But, rather than remove these completely and leave no statues in place, replicas, or exact copies were made so as to maintain the originally features of the famous avenue and square, yet an additional set of the Cheval Retenu par un Palefrenier statues were also produced and placed where the originals once stood, by the l'Abreuvoir du Parc de Marly, which in English translates to water trough or watering hole of the Marly Park. 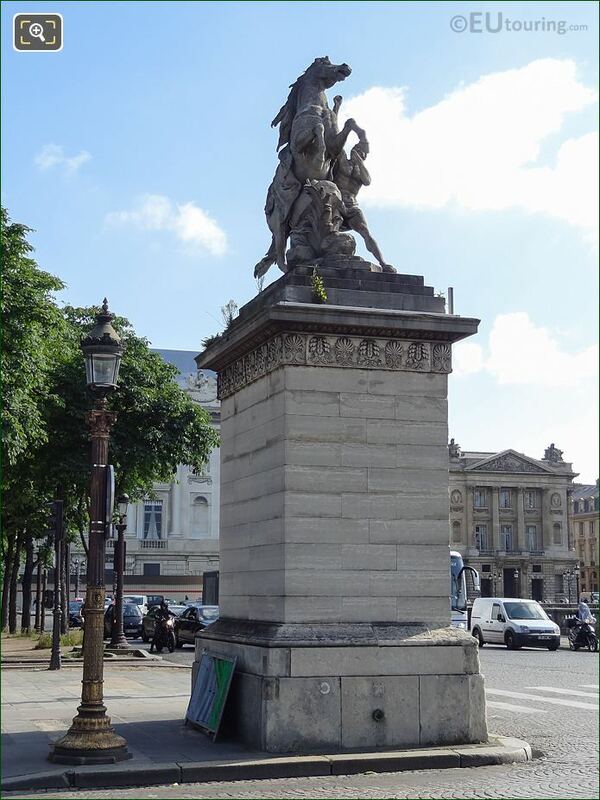 So even if you cannot manage to go inside the famous Louvre Museum, you can still get to see these exact copies, with this particular southern side Horse of Marly that you can see in this photo being positioned on the north western side of the Place de la Concorde, which is to the right hand side of the Avenue des Champs Elysees as you are looking from the square, and this is located in the 8th Arrondissement of Paris.